Your Life Rocks is all about helping working Christian moms create balance by teaching systems that work. First, we define balance by setting and moving toward goals in 8 areas of life. Faith is the foundation in which the other 7 sprout from. In this episode, we are diving into the area of family with our guest and author, Lindsay McCarthy. Lindsay is a wife and homeschool mom of two kids. She is the co-author of The Miracle Morning for Parents and Families and creator of GratefulParent.com where she blogs. She grew up in Pennsylvania and still lives there today as she enjoys writing, gardening, and playing field hockey. Lindsay loves to travel and one of her favorite trips was climbing Mt. Kilimanjaro- four months pregnant! 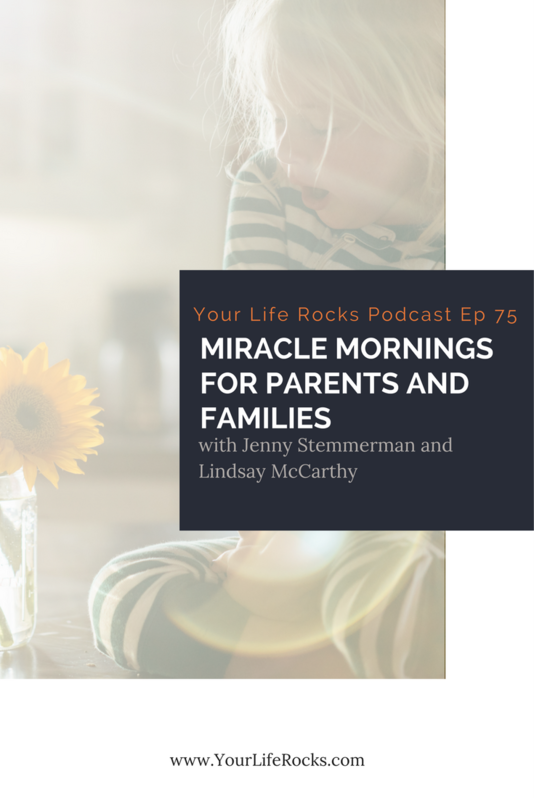 Lindsay shares how she got involved with Miracle Mornings and shares some tips on how to implement this structure to your family. 1. Wake up before your kids- allow yourself at least 15 minutes quiet time before your kids enter your day. 2. Teach Your children to have a morning practice of their own- follow CHARMS framework. 3. Stay Flexible and allow for grace- Don’t beat yourself up if it doesn’t go perfectly. 4. Combine SAVERS and CHARMS- for example do your reading while you exercise with an audiobook or combine silence with exercise with a yoga practice. Combine creativity and service by having your kids draw a picture for someone to brighten their day. 5. Help you kids get organized- free download on my website to create a CHARMS box. 6. Start the night before- having a bedtime routine will help everyone wind down and sleep better which makes for an easier morning. 7. Piggyback on habits already established. If you already have a strong reading practice try adding journaling to it.